If using graphics tablet to retouch confronted with problem to moving Photoshop panels. Like, wont to back on a history step and accidentally moving all panel with history. Maybe can make "lock interface" function? Do you save your workingspace settings? Window > working space > new workingspace... I have a extra setting when I use tablet. also does not solve the issue of accidentally un-docking the panel icon when you meant to just click on it. Happens to me with my tablet a lot too. This reply was created from a merged topic originally titled Locking palettes. As an illustrator who uses a Wacom tablet and stylus constantly, it frustrates me to no end that you can't lock the palettes so that when you call yourself tapping on something it doesn't come sliding out and you end up wasting time putting it back in position. Plenty of others MUST have an issue with this, no? This reply was created from a merged topic originally titled Photoshop: Panels are too easy to detach. This reply was created from a merged topic originally titled Photoshop: Panels are too easy to detach with a tablet. When using a tablet I find that I quite often accidentally detach a docked panel rather than opening it. 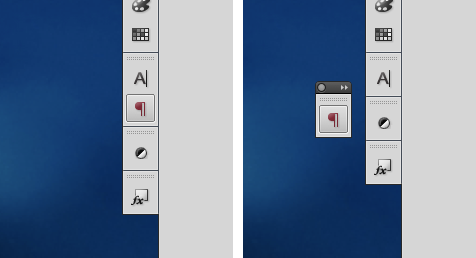 I know that the tolerance was changed in CS6 but I would like to see it increased even more for tablets in PS CC.